Space shuttle Enterprise will complete its journey to the Intrepid Sea, Air and Space Museum in New York on June 6, 2012. Space shuttle Enterprise will arrive at New York City's Intrepid Sea, Air and Space Museum today (June 6), after a 3-day sea trek that included a layover in New Jersey. The prototype shuttle, which did not fly in space but was used for atmospheric test flights, is scheduled to arrive at the Intrepid museum at roughly 12:30 p.m. EDT (1630 GMT). The prototype orbiter will then be craned onto the Intrepid's flight deck by 4 p.m. EDT (2000 GMT), according to museum officials. The Intrepid, which is docked on Manhattan's west side, is a retired World War II aircraft carrier that is now used to house aerospace exhibits. The first half of the shuttle's river ride, which took it past Coney Island in Brooklyn and Staten Island on Sunday (June 3), proceeded smoothly until a gust of wind pushed the orbiter into a railroad bridge abutment, leaving Enterprise's right wing damaged. 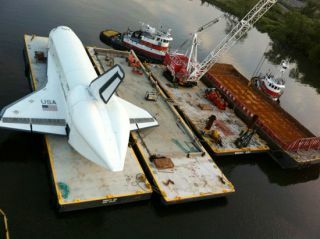 Intrepid officials said via Twitter that as of Tuesday, the shuttle had been repaired. Space exploration enthusiast Max Weider sent in this photo on June 4, 2012. He wrote: "I was at the Global Marine terminal in New Jersey this afternoon and got several pictures of the Enterprise docked at Weeks terminal." At about 11:40 a.m. EDT (1540 GMT), Enterprise will float by the World Trade Center and then travel up the Hudson River to the Intrepid, which is located at Pier 86 in Manhattan. "We expect good viewing locations to include the west side of Manhattan from Battery Park through the mid 40’s and on the Hudson [River] waterfront of NJ in Jersey City, Hoboken, and Weehawken," the Intrepid museum advised on its website. Once alongside the converted aircraft carrier, a crane will hoist Enterprise onto the flight deck for its public display. The craning operation is expected to take approximately three hours to complete. Work will then begin later this week to raise a steel and fabric shelter over the space shuttle Enterprise to protect it while on exhibit. The Intrepid's "Space Shuttle Pavilion" will open to visitors on July 19. NASA awarded Enterprise to the Intrepid in April 2011. At the same time, the space agency assigned the museum homes for its space-flown orbiters. Enterprise was moved to New York after it was displaced by shuttle Discovery at the Smithsonian National Air and Space Museum's Steven F. Udvar-Hazy Center in northern Virginia. Editor's note: If you snap a photo of Enterprise on its barge as it makes its way to the Intrepid museum today and would like to share the image with SPACE.com and collectSPACE.com, send images and comments to tmalik@space.com and robert@collectspace.com.